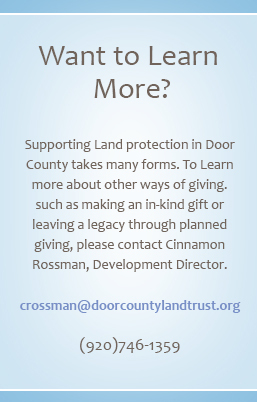 The Legacy Circle recognizes those donors who have shared in the mission of the Door County Land Trust by making a gift through their will, a bequest, trust, annuity, insurance or other planned or deferred gift. This is an important way you can help leave the gift of open spaces and natural places to future generations! If you have already named the Door County Land Trust in your estate planning documents, please let us know so we may thank you and add you to our list of Legacy Circle Members. 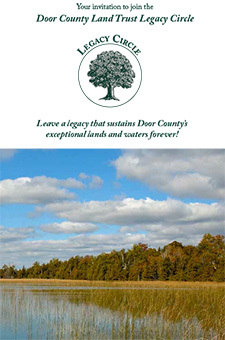 For information about including the Door County Land Trust in your estate plan, please call our Sturgeon Bay office at (920) 746-1359 to request a copy of our Legacy Circle booklet be mailed to you. If you have any questions about making a planned gift, please ask to speak with Cinnamon Rossman, Development Director. To let us know of your intention to make a planned gift, please complete and return our confidential Legacy Circle Note of Intent.